I got a supportive e-mail from my tutor during the visit to Arles, which was good news. I am encouraged to carry on "off piste" with the assignment and he likes the "simple cut and paste aesthetic". There is, I think, a challenge in trying to retain some of that whilst also looking to achieve 'professional standards' in the final image/print - a challenge but not unachievable. One thing has become very clear to me over the last ten days (and it was no great surprise) - I am never going to get to the standard of finish that I want with my D80 camera. it has some serious limitations (pixel count; noise in low light; old DX sensor) and is in serious need of a sensor clean. So - one very significant piece of progress since last week is illustrated in this image. I am now the proud owner of a NIKON D800. I am not a kit freak and I resist wholeheartedly the temptation to always have the latest gadget - but there comes a time! 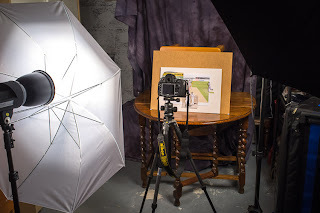 I also bought an Interfit 3-head studio lighting kit a few weeks ago - so, here we see the simple set-up that I have been using to start making some images for the assignment. Turning to the images themselves, I have moved the two originals on from the 'sketches' included in the last post. 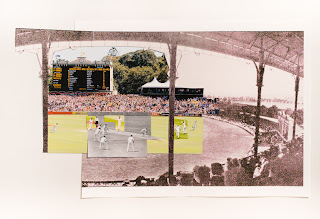 In the following version, all images in the compilation have been processed more carefully for colour, tonal balance etc (though they remain somewhat basic, being, in several cases, cut-outs from books or small downloaded images), and have been printed on photographic paper (and subsequently cut out with a craft knife). It feels more like a 'quality' image but there is some loss of the 'cut and paste' aesthetic. I even curled the edges of some of the images a little to introduce some shadow and depth. The images are quite crudely fixed to the backing paper, so that there is shadow and depth to the foreground 'painting', for example. The new version of my other 'original' actually combines photo paper and plain paper. 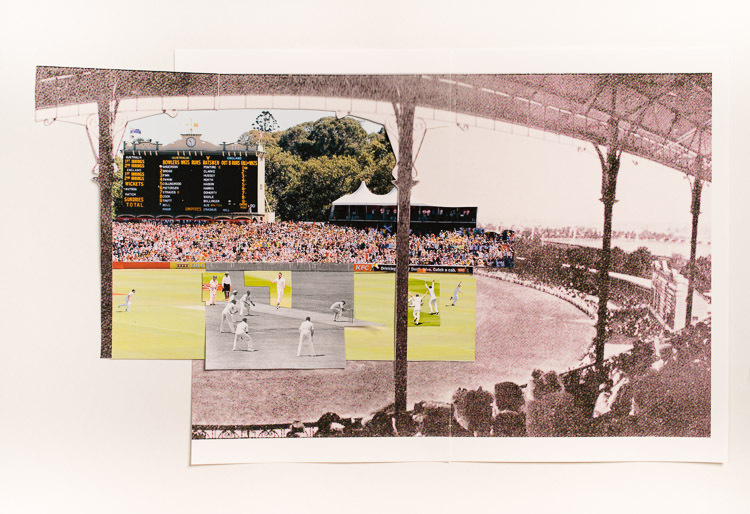 The black and white scene in the very centre (from the Bodyline Ashes series in the 1930s) is printed on plain paper and has curled more under the lights. It helps achieve the 'transparency' of process that I have referred to elsewhere, and is close to the Letinsky aesthetic, too. I also have a third image now - where I have varied the scale. I'm quite pleased with this one, as it has a crude simplicity about it - something like a 'still life' image - but manages to combine all sorts of elements of image-making. The background, for example, is a cropped screen-grab from the internet site, Cricinfo, showing the 'Hawk-Eye' presentation of a ball with which England bowler, Graeme Swann, dismissed Australian batsman, Rogers, in the Fourth Test of this summer. But that very 21st century 'aesthetic' (if that's an appropriate word!) 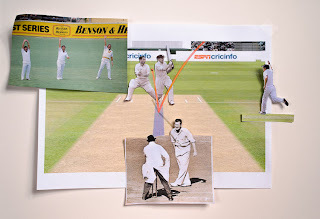 is being linked to Jim Laker's polite appeal to an umpire in the 1950s, as he seems to bowl to a 1940s Don Bradman. This is the kind of combination which, if processed and printed at a suitable quality level, would, I hope, interest the viewer but also raise questions about what exactly I've done and, maybe, why? 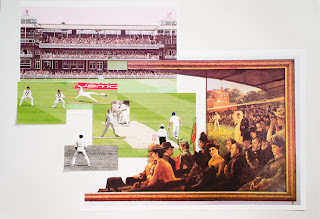 I have other ideas to work on - an image based around a television view of the game, for example, and I might even have a go at a 'portrait'. - and all images will, eventually, be subject to more 'processing'.